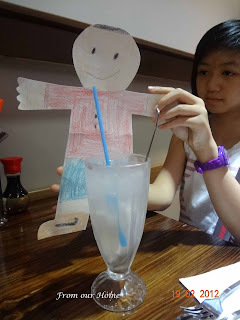 Who is Flat Stanley? He is a character from Jeff Brown's beloved book about a boy who was flattened by a bulletin board. Now that Stanley was as thin as a piece of cardboard, he could travel by mail, fly like a kite everywhere and anywhere. 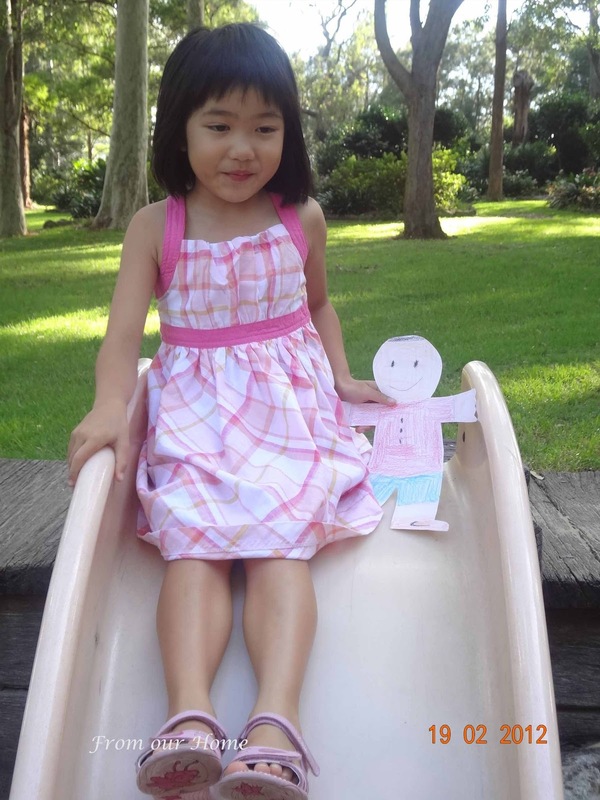 Flat Stanley arrived at our home via an A5 sized envelope sent from USA. My nephew, M had sent Flat Stanley to Caitlin. M had asked Caitlin to help him with his school project. 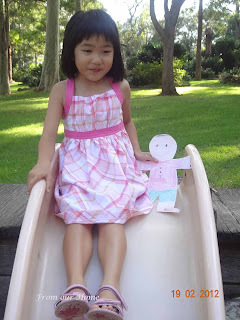 Each student in M's class had drawn and cut out Flat Stanley and sent him to their friends and family around the world. 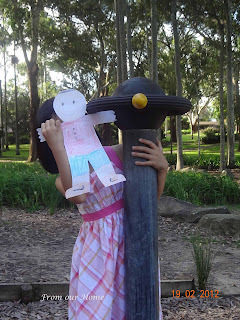 The task was to allow Flat Stanley to spend some time with us and to show Flat Stanley the sights in Sydney. Flat Stanley spent about 4 weeks with us. During that time, we took him on a train across the Sydney Harbour Bridge. He also went across the bridge in the car. Caitlin took Flat Stanley into school to spend some time with her Year 1 class. Ms G, the Teacher Librarian read the book about Flat Stanley to the class. 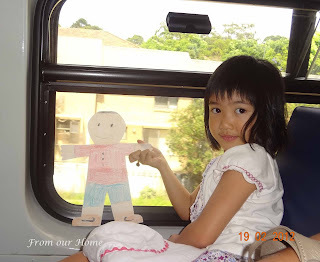 Flat Stanley then had a play with each Year 1 girl. He also had his photo taken with the entire Year 1 class to remember his visit to the school. 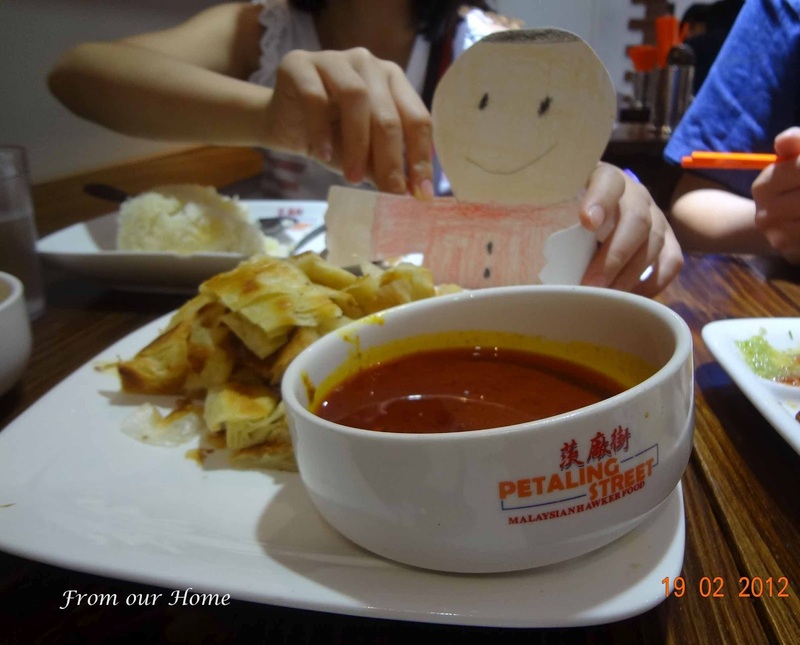 One Sunday we took Flat Stanley for lunch at Petaling St, a Malaysian eatery in Sydney. Flat Stanley had a plain roti canai with curry sauce, which was a bit spicy for him. He cooled down his palate with an icy cold coconut juice. On a beautiful sunny day (which was a rare event in Sydney this summer), we took Flat Stanley to the park across our home. At the park, Flat Stanley had great fun on the slides and swings. He was also brave enough to spin around this spinning equipment. Makes me dizzy thinking about it. Flat Stanley has now returned to USA (via Australia Post) with some souvenirs of Australia - kangaroo soft toy, boomerang and a tea towel with pictures of the Sydney Harbour Bridge and Opera House. He also managed to sneak in a book about Sydney and a Aussie flag postcard. We enjoyed having Flat Stanley to visit. We hope he will come again soon. 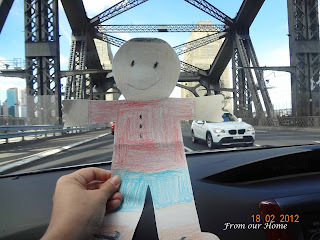 I am sure it was fun for your gal to show Flat Stanley around Sydney. This was so interesting. When Flat Stanley can visit Malaysia and us? Tee Hee. Love the pics! Bet Flat Stanley had an AWESOME time seeing the sights of Sydney and eating all that scrumptious food! What a great project!..